The general floor is evolving: Patients require higher-acuity monitoring, and time constraints on nursing staffs are greater than ever. 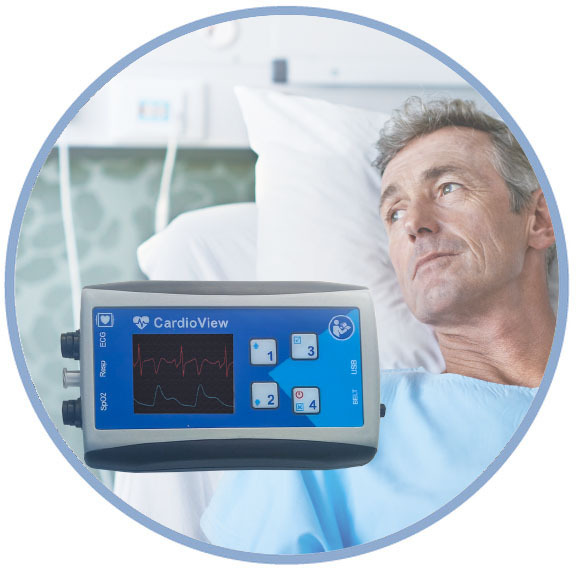 Based on the easy-to-use, all encompassing CardioView Telemonitoring System and offering many advantages not found with other solutions, the CardioView device is designed to help you enhance careon the general floor. CardioView goes far beyond traditional spot-check and telemetry monitoring. The CardioView Telemonitoring System is a next generation ambulatory monitor that measures and presents data in a way that helps nurses and doctors identify patients at risk regardless of geography. By calculating an early warning score and providing pictorial clues to the need to respond, it transforms monitoring to a combination of detection and advice. With such advisory and notifications on various handheld devices, CardioView is the future of ward monitoring. A hospital is a huge professional ecosystem, and it takes a large-scale solution to address its day-to-day challenges. Real-time continuous patient monitoring can solve many of the problems doctors and nurses face. With monitoring, caregivers save time checking vital signs, easily access patient vital sign records, avoid false alarms and catch danger signs fast. CardioView let you do all that as efficiently as possible. The CardioView System is a flexible patient-worn monitoring solution that goes far beyond the capabilities of traditional patient monitors. It enhances care by providing wireless, near-real time monitoring, letting caregivers see any developing problems instantly. Patients can wear it while walking throughout the facility (or even outside it), so monitoring never interferes with their recovery. This innovative, easy-to-use, and multi-purpose monitoring solution offers 3-, 5- and 12-lead diagnostic ECG, heart rate, SpO2, plethysmogram, respiration, SkinTemp, and continuous non-invasive blood pressure*. Even the most accurate system isn’t useful if clinicians lose signal or can’t see recent information. The CardioView device is a continuous transmitter that uses built-in Wi-Fi and 3G radios for reliable longer-term ambulatory monitoring. Its Early Warning Score (EWS)* feature allows the CardioView device to immediately detect vital changes with high accuracy. It works on your most high-priority patients. The ECG arrhythmia detection supports nonstop surveillance of cardiac patients regardless of where they stay in the medical facility. Stay connected to your patients, whether they’re in bed, in transport or walking around the facility. The CardioView Telemonitoring System is an all-encompassing platform for comprehensive and continuous ECG and vital signs monitoring. With this system, there’s no need to lose access to a patient’s current health status—and there’s no need to keep them in bed just for monitoring. It’s convenient and comfortable- the CardioView device is connected to the patient’s chest with just one wire, allowing for freedom of movement and accurate, noise-free monitoring of all vital signs including ECG, heart rate, skin temperature, respiration, SpO2, plethysmogram and beat-to-beat, non-invasive Blood Pressure*. Clinicians no longer have to choose between letting patients walk around and keeping an eye on their condition. CardioView is designed to enhance patient safety, allowing early detection of deterioration and keeping doctors informed about every development. For disaster relief operations or emergency medical services (EMS), time isn’t just money—it's a matter of life and death. CardioView helps emergency medical workers save lives. Our mobile monitoring systems are simple to use in even the most urgent situations. Patient status is automatically livestreamed to anyone who needs to see it, whether you’re a paramedic in the ambulance, a doctor at the hospital or a specialist at a faraway facility. CardioView ambulance monitoring takes telemonitoring to the next level, helping medical workers save lives in the most fast-paced, urgent conditions. An ambulance-to-hospital based telemedicine system is the best example of how mobile technology can help save lives. It provides real-time patient information to the hospital via wireless communications, enabling remote diagnoses and primary care and reducing rescue response time. Providing medical care to patients who need a ventilator is among the most demanding tasks in medicine—these patients need frequent attention from home care providers, and careful monitoring to ensure that their condition does not worsen. This can limit the number of patients each medical professional can care for, and increase the risk of adverse events. The CardioView Ventilation Monitoring application is designed to help medical professionals provide the best possible level of care by ensuring they have the most recent information, at all times. Our system transmits clinical data from a ventilation device to a remote station, where members of their medical team can review and analyze it.